Completely updated, the Fifth Edition of this standard-setting two-volume reference presents the most advanced diagnostic techniques and the latest information on all currently known disease entities. More than 90 preeminent surgical pathologists offer expert advice on the diagnostic evaluation of every type of specimen from every anatomic site. The Fifth Edition contains over 4,400 full-color photographs. All full-color illustrations have been color-balanced to dramatically improve image quality. A strong grounding in basic histology is essential for all pathologists. However, there had always been a gap between histology and pathology in which histologic information specifically for the pathologist was often lacking. Histology for Pathologists deals with the microscopic features of normal human tissues, from the perspective of the surgical pathologist. This is the only text that uses human (vs. animal) tissues for the histology. It is the best reference in the literature for information on normal histology, and, as such, is essential for all clinical pathologists. Written by pathologists for pathologists, the new edition will update the pathologist's understanding of normal histology up to date with the incremental advances made in the last five years. The 3rd edition has become a "classic" purchased by virtually all residents beginning their pathology training, as well as pathologists in practice. The 4th edition will build on that substantial foundation. Presented in the renowned, fast-access format of other Washington Manual® titles, this excellent book is a practical guide to the clinical practice of surgical pathology. This valuable resource covers all aspects of surgical pathology for every organ and anatomic site, including gross examination and dissection; microscopic diagnosis of medical as well as surgical diseases; tumor classification; and tumor staging. Separate chapters are devoted to ancillary surgical pathology techniques, including immunohistochemistry, immunofluorescence microscopy, electron microscopy, frozen section diagnosis, flow cytometry, DNA and RNA based molecular methods, and imaging technologies. A companion Website offers the fully searchable text plus an image bank of more than 2700 figures. Completely revised with practical guidance in daily urological pathology sign-out and the latest recommended diagnostic approaches, the new edition of this comprehensive reference equips you to accurately diagnose specimens of the entire urinary tract and male reproductive system plus the adrenal glands. It begins with a look at normal anatomy and histology for each organ system...followed by discussions of the pathology of congenital anomalies, inflammations, non-neoplastic diseases and neoplasia. An emphasis on clinicopathologic and radiographic-pathologic correlations makes this a true diagnostic decision-making guide. A consistent format enables you to locate critical information quickly, and morethan 1500 high-quality illustrations - most in full color - make diagnosis even easier. And now, as an Expert Consult title, this reference includes access to a companion web site offering this unparalleled guidance where and when you need it! Features a downloadable Online Image Collection that you can use to enhance your presentations. Fully updated, the 4th edition of Cytology helps you apply the latest diagnostic techniques for the interpretation of a complete range of cytological specimens. This medical reference book offers you quick access to the newest methods and adjunct tests, all in a brief, highly readable format that makes quick work ofreviewing the key information available on this powerful yet minimally invasive method. It's a perfectly practical bench manual for trainees and practicing pathologists alike! Rosai and Ackerman's Surgical Pathology delivers the authoritative guidance you need to overcome virtually any challenge in surgical pathology. Recognized globally for his unmatched expertise, preeminent specialist Juan Rosai, MD brings you state-of-the-art coverage of the latest advancements in immunohistochemistry, genetics, molecular biology, prognostic/predictive markers, and much more - equipping you to effectively and efficiently diagnose the complete range of neoplastic and non-neoplastic entities. And now, with online access at www.expertconsult.com, you can easily search the contents of this 2-volume masterwork online and download more than 3,300 detailed images. 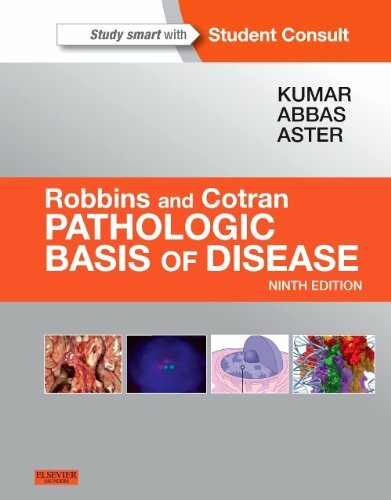 Dependable, current, and complete, Robbins and Cotran Pathologic Basis of Disease, 9th Edition is the perennially best-selling text that youâ€™ll use long after your medical student days are behind you. A world-class author team headed by Drs. Vinay Kumar, Abul Abbas, and Jon Aster, delivers the latest, most essential pathology knowledge in a readable, interesting manner, ensuring optimal understanding of the latest basic science and clinical content. High-quality photographs and full-color illustrations highlight new information in molecular biology, disease classifications, new drugs and drug therapies, and much more. obbins Basic Pathology delivers the pathology knowledge you need, the way you need it, from the name you can trust! This medical textbook's unbeatable author team helps you efficiently master the core concepts you need to know for your courses and USMLE exams. - A FREE companion website with access to the E-book, image bank, and an interactive question bank featuring all the questions from the book for engaging, effective test preparation!